As mentioned at the beginning, roasting of coffee is more art than science. Roasters have a large number of variables to consider in order to (constantly!) achieve the best possible desired result. The roast profile is defined by: temperature and roasting time. Central components are temperature rise (when / how intense do i heat the beans) and reduction of roast temperature over time. This roast profile varies depending on the type of beans used and leads to different taste characteristics. The roast time (from small batch roasters) is between 15-30min. and takes place at temperatures between 180 and 250 ° C.
The roast profile used by the roasting master determines to a high degree of what flavours and characteristics of the coffee are emphasized at the end. 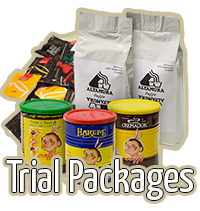 Next to the roast profile, origin, type and processing of the beans influences the taste – vice versa these factors determine the type of roasting (in addition to moisture of raw beans, roast batch size, air flow, drum rotation, cooling duration...). The different roast levels of beans are referred to depending on the roasting temperature. A widely used method to determine the actual degree of roast of a bean is the visual classification of the color. 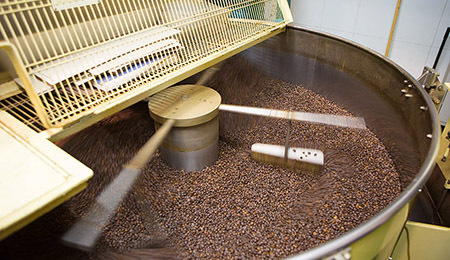 During the roasting process, the beans change color - from yellow to darker browns. In the later stages of roasting oil begins to appear on the surface of the beans. 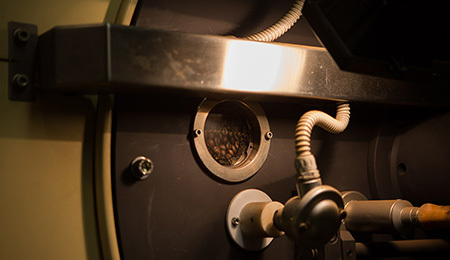 However, the purely visual assessment is usually not accurate enough, therefore a combination from bean temperature, smell, color and sound is used to control the roasting process. takes place at 200-202 ° C and is similar to the crack of popcorn (only slightly quieter). is reached at 224-226 ° C.
These "cracks" are caused by gases released during the roast process. A very light roast level - immediately at first crack. Light brown color with prominent acidity. Moderate light brown color. Complex acidity. Moderate dark brown with light surface oil, more bittersweet, caramel flavor, acidity muted. Nearly black and shiny, burnt tones become more distinct, acidity nearly eliminated.